Grab and Go Bag, Clear, 11" x 10" + 3.5"
Dimensions: 11" x 10" + 3.5"
Grab and Go Bag, Vegetable Print, Green, 11" x 10" + 3.5"
Saddle Pack Portion Bag, Yellow, 5.5" x 9"
Saddle Pack Portion Bag, with Flip, Clear, 6.5" x 7"
Superwave Carryout Bags, Clear, 1.3 Mil, 12" x 12" + 3"
Dimensions: 12" x 12" + 3"
Lunch Tote Bag, Clear , 12" x 10" + 4"
Dimensions: 12" x 10" + 4"
Lunch Tote Bag, Purple, 12" x 10" + 4"
Lunch Tote Bag, Green, 12" x 10" + 4"
Lunch Tote Bag, Yellow, 12" x 10" + 4"
Lunch Tote Bag, Blue, 12" x 10" + 4"
Lunch Tote Bag, Red, 12" x 10" + 4"
Lunch Tote Bag, Black, 12" x 10" + 4"
Lunch Tote Bag, Pink, 12" x 10" + 4"
T Shirt Bag, White, 11.5" x 6.5" x 21.5"
T Shirt Bag, White, 12" x 7" x 22"
Superwave Carryout Bags, White, 1.25 Mil, 16" x 16" + 8"
Dimensions: 16" x 16" + 8"
T Shirt Thank You Bag, White, 11.5" x 6.5" x 21.5"
Grocery Bags, 'ReUSAble' Beige, 2.25 Mil, 18" x 18" + 6"
Dimensions: 18" x 18" + 6"
Grocery Bags, 'ReUSAble' Ivory, 2.25 Mil, 18" x 20" + 6"
Dimensions: 18" x 20" + 6"
Superwave Carryout Bags, White, 1.5 Mil, 24" x 20" + 11"
Dimensions: 24" x 20" + 11"
T Shirt Bag, Frosted Clear, 20" x 10" x 28"
Dimensions: 20" x 10" x 28"
Superwave Carryout Bags, White, 1.25 Mil, 18" x 16" + 9"
Dimensions: 18" x 16" + 9"
Superwave Carryout Bags, White, 1.2 Mil, 12" x 13" + 5"
Dimensions: 12" x 13" + 5"
Ameritote Soft Loop Carryout Bags, White , 1.5 Mil, 16" x 11" + 8"
Dimensions: 16" x 11" + 8"
Superwave Carryout Bags, ReUSAble White, 3 Mil, 34" x 21" + 14"
Dimensions: 34" x 21" + 14"
Lunch Tote Bag, Clear, 16" x 15" + 6"
Dimensions: 16" x 15" + 6"
Lunch Tote Bag, Purple, 16" x 15" + 6"
Lunch Tote Bag, Green, 16" x 15" + 6"
Lunch Tote Bag, Yellow, 16" x 15" + 6"
American Retail Supply offers a large variety of Food Packaging Bags including, superwave, ameritotes, t-shirt bags and more! Not only are these bags are great for take-out but also amazing for delivery. 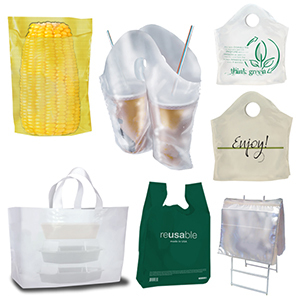 These food packaging bags are high quality and durable. With 45+ products to choose from, here at American Retail Supply we have you covered. These Food takeout bags feature a comfortable die cut handle, extra wide opening for quick and easy loading, and a flat bottom to prevent spills. What a perfect bag for go containers! Ameritote bag features soft loop handles and flat bottoms to prevent containers from tipping. This style of handle is very comfortable for carrying items.